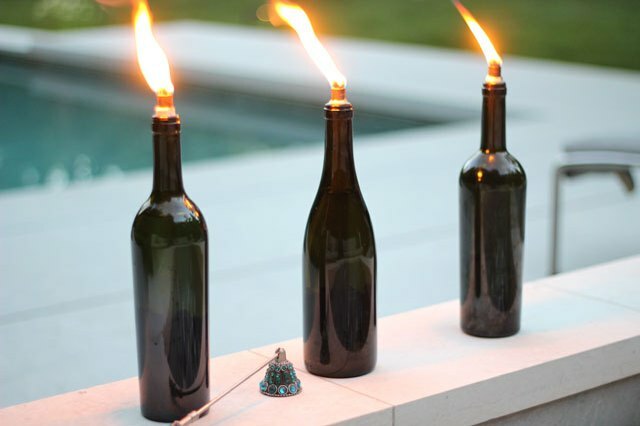 Tiki torches are a great way to light up your outdoor gatherings after the sun sets, and these DIY torches made from upcycled wine bottles will even help keep the bugs away. With just a few simple supplies from the hardware store, you'll have a low-cost source of illumination for your summer soirées that's as practical as it is elegant. Tiki torch wicks, which you can find in either the insect repellant or outdoor lighting aisle of the hardware store, are usually made of fiberglass and are 1/2 inch in diameter by about 9 inches long. Citronella-scented tiki torch fuel is stocked next to the wicks at the hardware store. 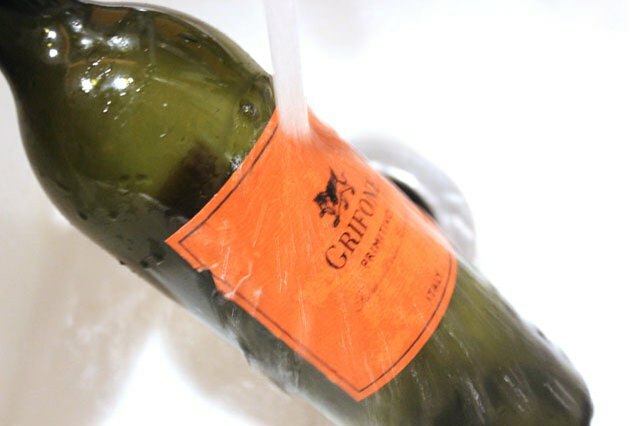 Wash the empty wine bottle in hot, soapy water to remove any wine residue. Continue running the bottle under hot water, rubbing with your fingers or a scrubber to remove the front and back labels as well as the adhesive holding the labels. Some wine bottles have more adhesive than others. Be patient — with a little elbow grease, the labels will eventually come off. Thoroughly dry the clean wine bottle. 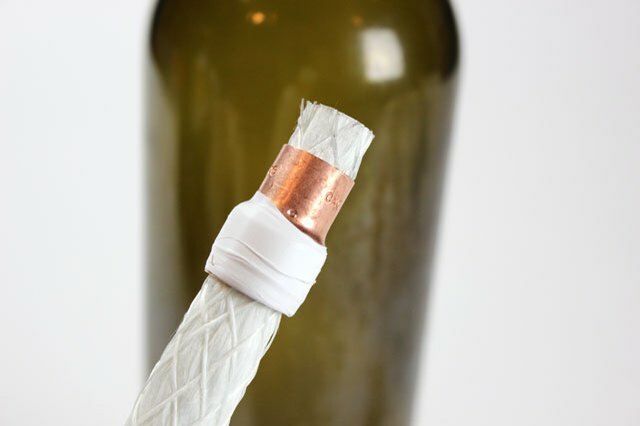 A copper coupling, which you can find in the plumbing section at the hardware store, will be used to hold the wick in place in the wine bottle. 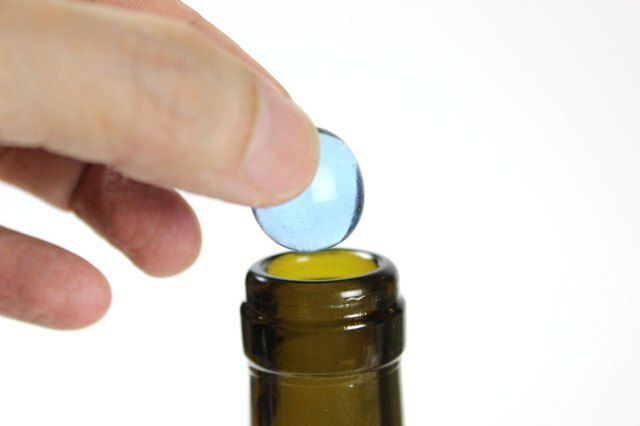 The openings of different wine bottles may vary, but the 1/2-inch by 3/8-inch size coupling will fit most bottles. (I carried my wine bottles to the hardware store to make sure the couplings fit.) The coupling has two sections — the wide part will fit in the opening of the wine bottle, and the narrow part will be at the top of the torch with the wick extending out of it. 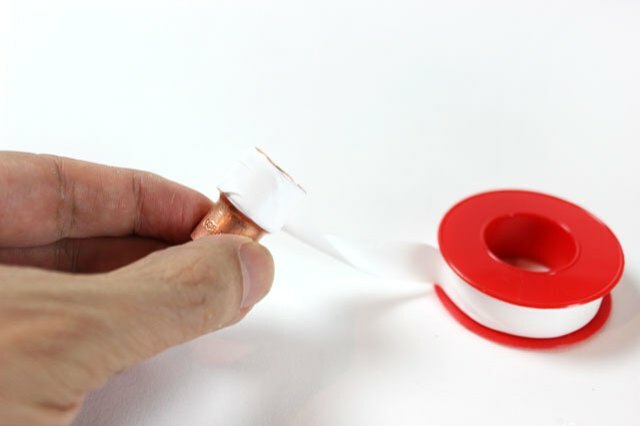 Because the wide part of the coupling is usually still smaller than the bottle opening., wrap this section with Teflon thread seal tape to increase the thickness. It took about 10 revolutions of tape for the coupling to fit snugly in my bottle. 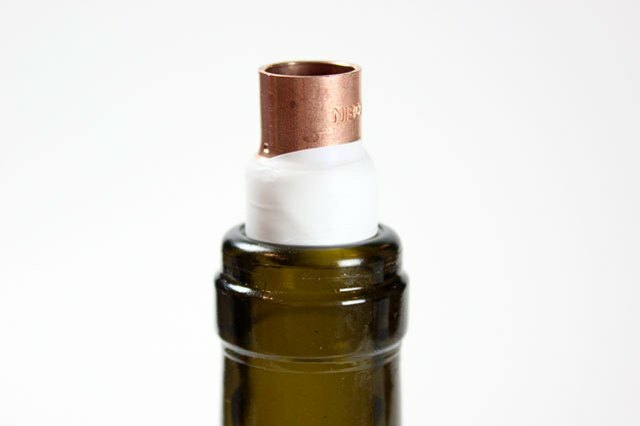 Test it by placing the coupling in the wine bottle, but remove it afterwards. Insert a tiki torch wick through the coupling, with about 1/4 inch extending past the narrow end of the coupling. After inserting the wick, set it aside for now. Fill the wine bottle with about 4 inches of glass beads or marbles. The beads serve two purposes: they add weight to the bottle to help keep it from tipping over, and they take up room in the bottle so you don't have to use as much citronella fuel. 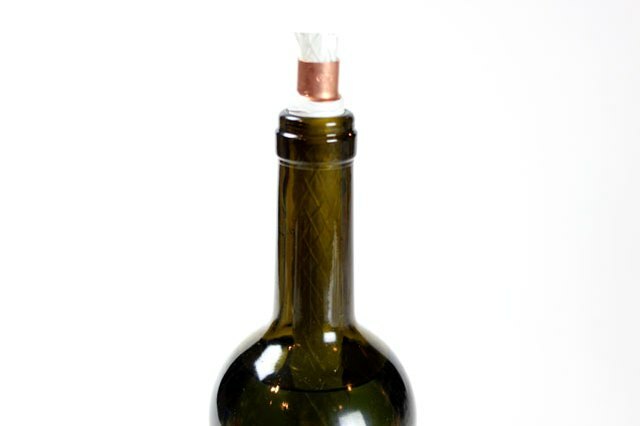 Using a funnel, fill the wine bottle with tiki torch fuel up to the point where the bottle starts to narrow. Don't overfill the bottle, as the wick will displace some of the fuel. Insert the wick in the bottle, and press down firmly on the coupling to create a tight seal at the opening. Be sure that about 1/4 inch of wick extends past the tip of the coupling. Allow a few minutes for the wick to absorb the fuel. You will know that the fuel has reached the top of the wick when the tip appears blue like the color of the fuel. Then it's time to light the torch. 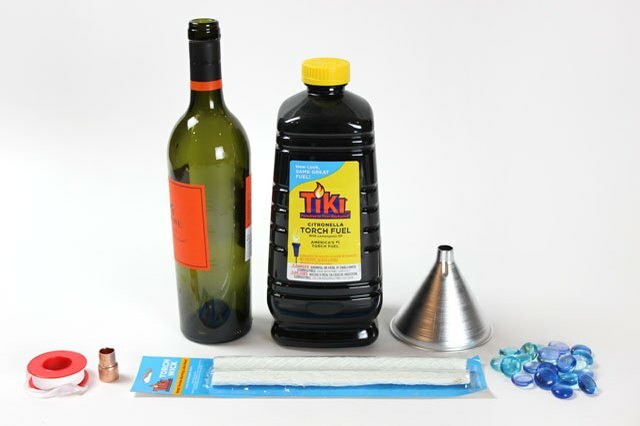 Make several wine bottle tiki torches for a beautiful display. Never leave a lit torch unattended, and keep out of reach of children and animals.